Caine Hammond suffered a subdural hematoma following an argument and scuffle with Lucas John Scot Bell, who pleaded guilty earlier this month to unlawfully killing the dad-of-one at Euleilah on April 27, 2012. The NewsMail was contacted by Mr Hammond's former partner, Natalie Frickmann, the mother of his only daughter, seven-year-old Isla Jade. Ms Frickmann still remembers the day police called her to tell her that Mr Hammond had been in an altercation. "I sat Isla down when we got home and I said to her, 'Mummy has something to tell you sweetie. Dad's hit his head very hard and he is in the hospital, the doctors and nurses are doing every thing they can for him, but he might not wake up'," she said. She said Isla was adamant she wanted to see her dad, so the pair organised flights and rushed to his bedside in a Brisbane hospital. "Isla and I spent the next three days beside his bed talking and Isla was asking me questions that no mother should have to answer: 'mum why won't he wake up? I know dad would want to see me so why won't he wake up? '," Ms Frickmann said. Knowing Mr Hammond's chance of survival was pretty slim, Ms Frickmann spoke to one of the nurses about what Isla could do with her dad. "We then came up with an idea that they could do hand prints together so that she had some thing to keep for the last time with her dad," she said. "As tears streamed down my daughter's face she placed her tiny painted hand and placed it onto two pieces of paper, then she helped the nurse spread her dad's hand out and painted it - she then placed his hand on the paper beside her hand print. Ms Frickmann said as Mr Hammond was an organ donor, his life support machine couldn't be turned off when they said goodbye. 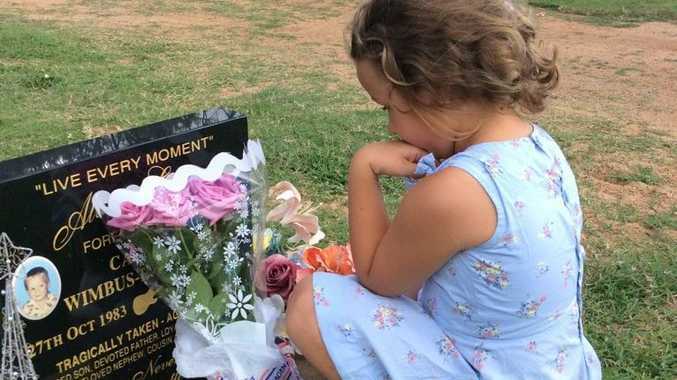 "That night Isla sat up in her bed and said, 'Mum, I am going to miss dad and I love him very much'," she said. "It was not long after that I received a phone call from the hospital to say that they had found donors and had switched his machine off." Ms Frickmann said losing Mr Hammond was the "worst thing" a child should have to go through, having to say goodbye to a parent who was taken in "a violent way". "When (Isla) is old enough to understand that people do such cruel things I will tell her what happened to her father," she said. "I don't believe the sentence handed down to Lucas Bell was enough. I feel the justice system has failed Caine, his daughter and his family - this is simply just not good enough. "They are trying to get rid of coward punches and alcohol fuelled violence - no one is going to take any notice if our justice system is handing out a slap on the wrist, two years for taking someone's life, someone's father, someone's son and friend to many." Bell will be eligible to apply for parole on September 17, 2015.